Beautiful and delicate long rectangular glass frames handmade with pressed ferns, cow parsley and other wildflowers. 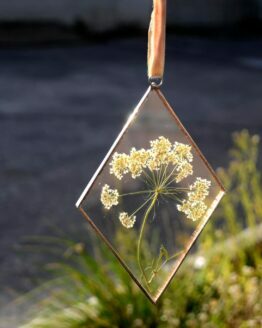 Each flower is completely unique and encased inside a sealed glass frame in a choice of copper patina or silver. Nikki collects the flowers on local walks and makes the frames by hand in her Bristol studio. Hang the frame on a wall, in a window or mix and match different flower frames to make a feature wall in your home. One of each style available as photographed. Note : Solder contains 40% lead and 60% tin. Paly Glass is Nikki James from Totterdown in Bristol. 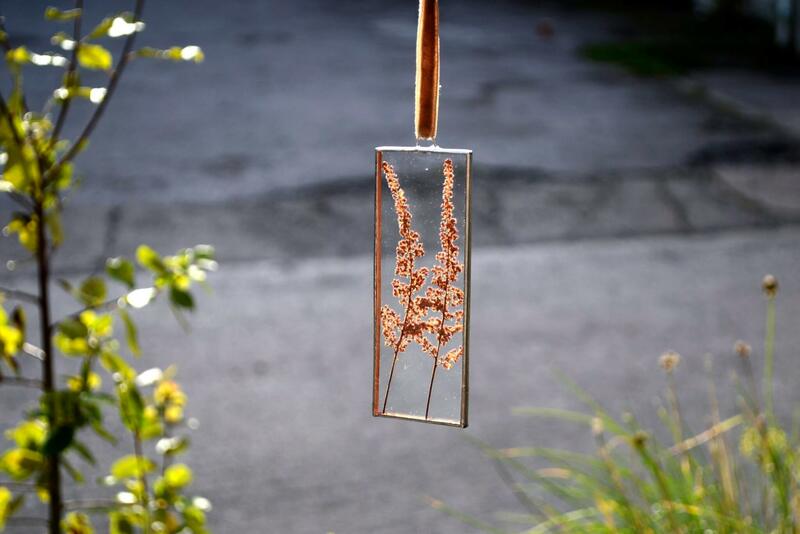 After finding an amazing vintage glass terrarium at at a car boot sale she knew she wanted to make her own. 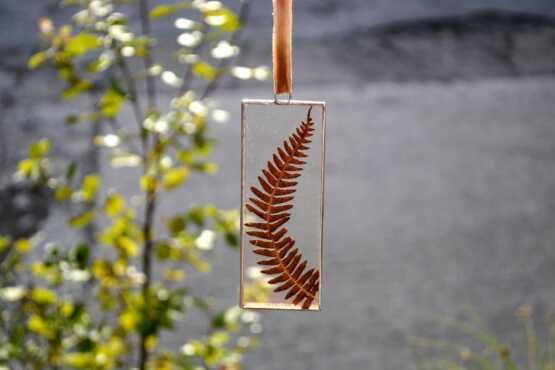 She studied stained glass at Orchard Studios in Bristol where she learned the copper foiling method and once she started cutting glass she couldn’t stop and immediately bought all the tools she needed and set up a home studio in BS4. She collects ferns, cow parsley and other flowers from local walks and her mum’s garden and presses them and then frames them by hand. Each frame is hand cut and assembled by grinding, shaping, foiling and soldering each piece. Every design she makes is completely unique as no two plants are identical. She loves all things geometric and her style of frames represents that. Nikki captures nature and frames it forever for you to enjoy in your home.